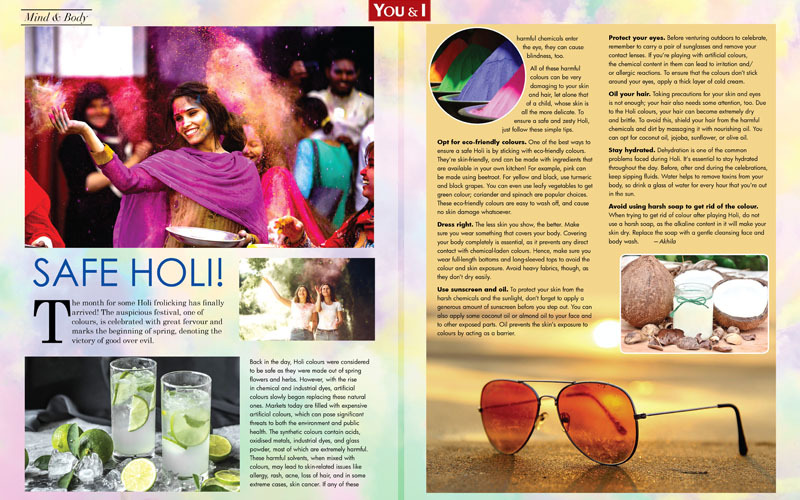 The month for some Holi frolicking has finally arrived! The auspicious festival, one of colours, is celebrated with great fervour and marks the beginning of spring, denoting the victory of good over evil. Back in the day, Holi colours were considered to be safe as they were made out of spring flowers and herbs. However, with the rise in chemical and industrial dyes, artificial colours slowly began replacing these natural ones. Markets today are filled with expensive artificial colours, which can pose significant threats to both the environment and public health. The synthetic colours contain acids, oxidised metals, industrial dyes, and glass powder, most of which are extremely harmful. These harmful solvents, when mixed with colours, may lead to skin-related issues like allergy, rash, acne, loss of hair, and in some extreme cases, skin cancer. If any of these harmful chemicals enter the eye, they can cause blindness, too. All of these harmful colours can be very damaging to your skin and hair, let alone that of a child, whose skin is all the more delicate. To ensure a safe and zesty Holi, just follow these simple tips. Opt for eco-friendly colours. One of the best ways to ensure a safe Holi is by sticking with eco-friendly colours. They’re skin-friendly, and can be made with ingredients that are available in your own kitchen! For example, pink can be made using beetroot. For yellow and black, use turmeric and black grapes. You can even use leafy vegetables to get green colour; coriander and spinach are popular choices. These eco-friendly colours are easy to wash off, and cause no skin damage whatsoever. Dress right. The less skin you show, the better. Make sure you wear something that covers your body. Covering your body completely is essential, as it prevents any direct contact with chemical-laden colours. Hence, make sure you wear full-length bottoms and long-sleeved tops to avoid the colour and skin exposure. Avoid heavy fabrics, though, as they don’t dry easily. Use sunscreen and oil. To protect your skin from the harsh chemicals and the sunlight, don’t forget to apply a generous amount of sunscreen before you step out. You can also apply some coconut oil or almond oil to your face and to other exposed parts. Oil prevents the skin’s exposure to colours by acting as a barrier. Protect your eyes. Before venturing outdoors to celebrate, remember to carry a pair of sunglasses and remove your contact lenses. If you’re playing with artificial colours, the chemical content in them can lead to irritation and/or allergic reactions. To ensure that the colours don’t stick around your eyes, apply a thick layer of cold cream. Oil your hair. Taking precautions for your skin and eyes is not enough; your hair also needs some attention, too. Due to the Holi colours, your hair can become extremely dry and brittle. To avoid this, shield your hair from the harmful chemicals and dirt by massaging it with nourishing oil. You can opt for coconut oil, jojoba, sunflower, or olive oil. Stay hydrated. Dehydration is one of the common problems faced during Holi. It’s essential to stay hydrated throughout the day. Before, after and during the celebrations, keep sipping fluids. Water helps to remove toxins from your body, so drink a glass of water for every hour that you’re out in the sun. Avoid using harsh soap to get rid of the colour. When trying to get rid of colour after playing Holi, do not use a harsh soap, as the alkaline content in it will make your skin dry. Replace the soap with a gentle cleansing face and body wash.